To those who are new - welcome! To those who are coming back - it's good to see you again. :) I hope you'll take some time to peek around and check out a few of my projects. Last year I posted about my Halloween table runner. At that time I had yet to finish a normal sized quilt, so this is really my first BQF where I have a real quilt to show off. I'll try to keep the text brief - I know most of ya'll have a lot of posts to get through, and let's be honest, we're all mostly after the pictures anyways! I'd like to start with my most recent quilt, "Behind the Closet Door". This quilt was designed with a very special recipient in mind for her wedding gift. I'm so glad you were able to join along today. I sure hope to see more of you in the future! Wow! Gorgeous quilts. Well done! I really love that first quilt! I'm loving solids these days, and I like how you broke up the perfect symmetry a bit with this one. It's gorgeous! I love what you did with those solids - really unusual. And that lighthouse design is fabulous, well done! Love the rainbows, and the light house is very original! Great panel! Love your bed quilt! Great to be able to make something you really love for yourself! And I love how you used biased stripes for the light house. So creative! Love your quilts - very simple but effective. I especially like your lighthouses. Wonderful design! The fabrics translated into your pattern very well. Love the quilt. That quilt is amazing - I love the concept behind it, the gradation of colors with the breaks of grey. BEAUTIFUL. And I really love your lighthouses - what awesome graphic appeal, excellent design! Fun quilt and so nice you were able to please yourself while making itcfor someone else. 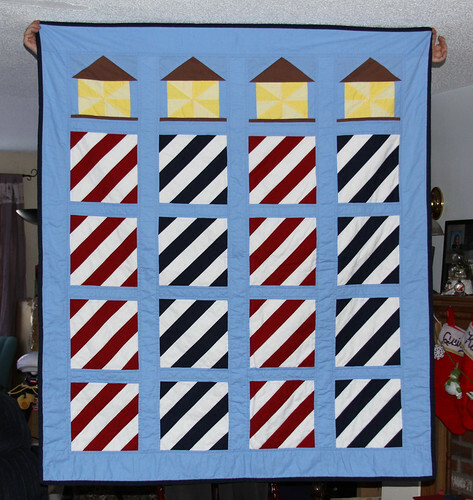 The lighthouse quilt is wonderful Thanls for sharing them both and have a great day! What a beautiful idea for a wedding quilt. All the colors of the rainbow, even the grey of the rain which serves to reflect the prism of promise in gorgeous color. I know exactly what you mean--I like the quilts I design myself the best. When someone wants me to make them a quilt, and they dictate the colors, the design, I feel like the fun is taken out it. My quilting is my "art", if you take my creativity out of it, it isn't mine anymore. I love your multi-colored closet door quilt. I am kind of a color nut so I really enjoy this rainbow of colors. Hi kelsey. This is a wonderful quilt. Great design. A very special gift!! "Behind the Closet Door is a gorgeous quilt! The light houses are fun. Great projects! Very original with those beautiful solids. Chapeau! I think both those quilts are great and I especially like the lighthouse one because it's something you liked even though it wasn't your normal "taste". I think it's great when a quilt or piece of art can pull us out of that zone. fun quilts! 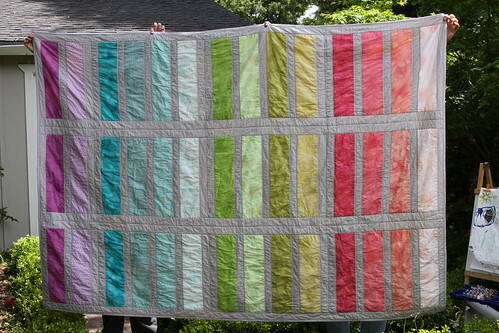 I especially like the rainbow quilt as I'm "percolating" some ideas for one of my own! It's beautiful! That's about as "real" as it gets, your colors are fabulous and it looks like something I'd love to snuggle under. I love those rainbowy strips! Both these quilts are very cool! I love the colors on the top one and your friend must have been floored to receive such a great gift. Super!! Great quilt - it looks like a paint box. The lighthouse is awesome too. I really like the style and simplicity of the wedding gift quilt. The colors are perfect. I am sure that your friend loves your wedding quilt- it is so bright and fresh looking. 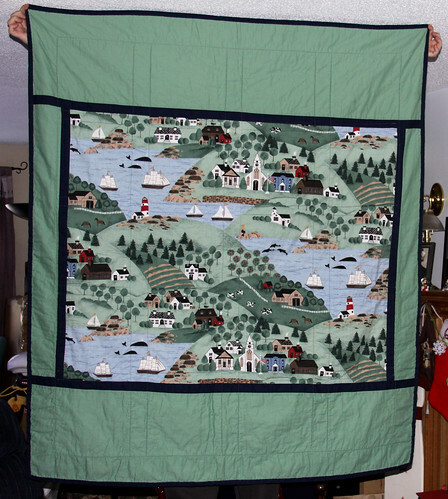 I love your lighthouse quilt- it is very clever- I bet it is also well loved. I love both those quilts!! The lighthosue one is such a cute idea. My mom loves lighthouses, so I may need to borrow this idea. :) Congrats on finishing your first quitls this year, it's a good feeling isn't it? Love your closet doors quilt - beautiful and subtle! all of them are wonderful, but the lighthouses! I think may steal your idea.